This is an original design I did to use exclusively on Royals minor league players. 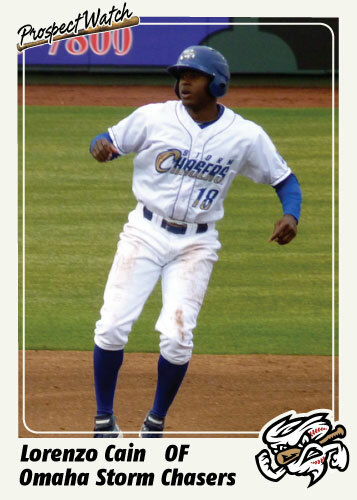 My plan is to familiarize myself with prospects in the Royals minor league system by posted one of these “Prospect Watch” cards of them and doing a quick blurb about them as well. 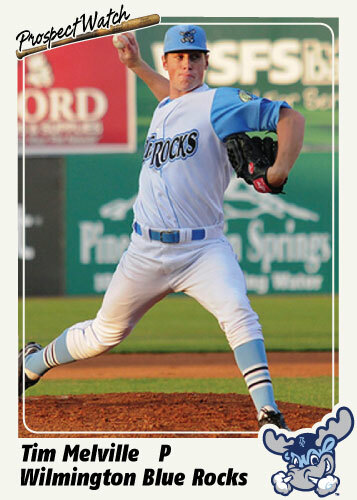 To choose Tim Melville, I just looked at the Blue Rocks roster to decide and simply picked a name I had heard of. The Wilmington Blue Rocks are a high single A affiliate for the Royals so the players they have still have a couple more steps before making it to the big leagues. Melville appears to have his hands full at that level this year though. He has posted a 4.56 ERA so far with a record of 8-8 in 24 games. He has tossed just over 100 innings and has struck out 83 with a WHIP of 1.56. As I will always reccommend; if you want to know more about Royals prospects, head over to The Pine Tar Press. It is a great site featuring prospects from all levels and the amount of knowlege about them on that site is amazing.